Anthracnose fruit rot of pepper (Capsicum spp.) is an economically important disease in many countries worldwide. 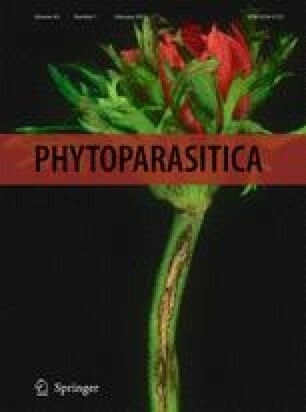 This study was conducted to identify and characterize the pathogens responsible for anthracnose disease in bell peppers (C. annuum L.) in Trinidad. Seventy-two percent of all isolates were Colletotrichum truncatum and 28% were C. gloeosporioides. Growth rate and conidia dimensions were reliable morphological markers that allowed differentiation between C. gloeosporioides and C. truncatum isolates. Benomyl sensitivity testing also distinguished between isolates of C. gloeosporioides and C. truncatum. C. truncatum was resistant to benomyl at all concentrations tested while C. gloeosporioides sensu lato was sensitive to concentrations above 0.1 μg ml-1 . Pathogenicity tests demonstrated different levels of resistance to anthracnose in various Capsicum genotypes. C. gloeosporioides sensu lato isolates caused significantly greater damage than C. truncatum isolates regardless of pepper cultivar. PCR with taxon- and species-specific primers produced amplicons of expected band sizes for all Colletotrichum species and only for C. gloeosporioides, respectively. Molecular analysis of ITS and β-tubulin sequences positioned C. gloeosporioides sensu lato and C. truncatum isolates from bell pepper into separate species-specific clusters. The authors wish to thank Ms. Lisa Teelucksingh for technical assistance and Mr. Neemal Do of ASASCO Trinidad. This work was funded in part by the University of the West Indies, St. Augustine Campus, Research and Publications Grant No. CRP.3.NOV11.8.